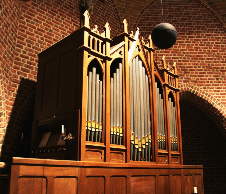 Description: The organ in the Catholic Blasiuskerk of Beckum (Holland) has been built by the Dutch organbuilder Gradussen in 1887. Restoration took place in 1981 by Dutch organbuilder Kaat & Tijhuis. The organ is mechanical.